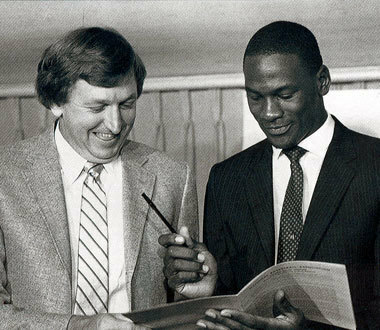 After winning the Naismith and the Wooden College Player of the Year awards in 1984, Jordan left North Carolina one year before his scheduled graduation to enter the 1984 NBA Draft. 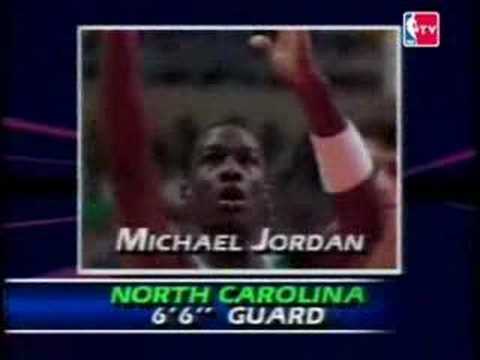 The Chicago Bulls selected Jordan with the third overall pick, after Hakeem Olajuwon (Houston Rockets) and Sam Bowie (Portland Trail Blazers). Jordan returned to North Carolina to complete his degree in 1986. The 1984 NBA Draft saw the selection of four players who would be named among the 50 Greatest Players in NBA History at the league's 50th anniversary in 1996: Hakeem Olajuwon, Michael Jordan, Charles Barkley and John Stockton. These four players accumulated seven MVP awards, 23 All-NBA First Team appearances, 45 NBA All-Star Game selections and were all inducted into the Basketball Hall of Fame. Many other solid players were drafted in 1984, including Otis Thorpe, Kevin Willis, Michael Cage, Sam Perkins and Alvin Robertson. Also of note is the Chicago Bulls' selection of track and field star Carl Lewis with the 208th pick overall. Lewis would stay with track and never played basketball for the Bulls. The Portland Trail Blazers drafted Mike Whitmarsh, who starred for the University of San Diego in both basketball and volleyball, in the fifth round. Whitmarsh played professionally in Germany for three years, but never made the NBA, and went on to much greater success in beach volleyball.